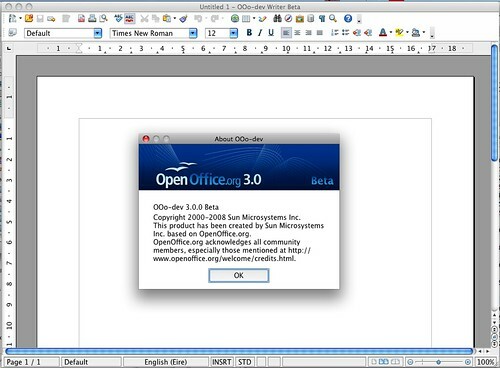 OpenOffice, the free opensource office suite, released OpenOffice 3.0 Beta yesterday. This latest release now runs on Mac OS X without requiring X11 to be running as well. And there are versions for Windows and Linux obviously. There are a host of new features like ODF Support, Office 2007/8 import/export and support for up to 1024 columns on the spreadsheet app to name but a few. With the killer combination of Google Docs (Google’s great hosted office app), OpenOffice and OOo2GD (an app to synch between OpenOffice and Google Docs), the justification for spending any amount of money on Office software has just disappeared! There is also a large number of extensions available for OpenOffice. Everything from template packs, through to report builders and Wiki writers! Download it, try it out. 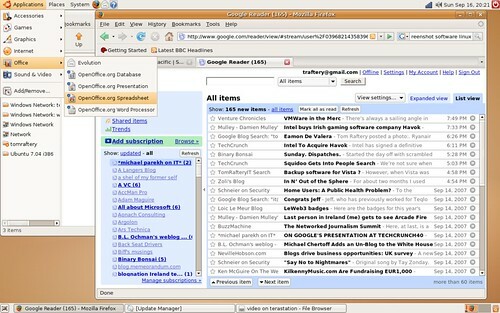 If you are worried that it will be a big change in UI from Microsoft Office – wait until you see the Office 2007 UI!!! And did I mention OpenOffice is free? I have said on a number of occasions that Microsoft should Open Source their Windows Operating System (and their Internet Explorer). I realise it is unlikely to happen in the near term but, I firmly believe it will happen in the not-too-distant future (when Microsoft realises that they can’t compete with Open Source). If you take it simply from a numbers perspective, Microsoft has 70,000 employees. If we say 40,000 are actively programming code for Microsoft (the rest being admin, management, marketing, etc.) then you are looking at a maximum of 10,000 who would have contributed to the development of Vista, Microsoft’s current Windows incarnation. I suspect the number is lower. Vista is estimated to have cost Microsoft $10 billion and six years to develop and they still shipped a fairly shoddy product. Presumably Microsoft will want to re-coup that investment before it even thinks about Open Sourcing Windows. Compare that with the various Linux distros. It is estimated that around 100,000 people have contributed to Linux’ development! I recently installed Ubuntu on my laptop and it simply blows Vista away in terms of performance and reliability. Why are Ubuntu and the other Linux distros so good? Feel free to add more in the comments! The economics of Open Source are counter-intuitive. IBM spends around $100m a year on Linux development. If the entire Linux community puts in $1 billion worth of effort and even half of that is useful to IBM’s customers, then IBM gets $500m of development for $100m worth of expenditure. If Microsoft could, in one fell swoop, get rid of their Windows piracy concerns, write better quality software, improve their corporate image, and radically reduce their development costs, do you think they would do it? Using Wubi, I installed Ubuntu onto my Vaio laptop over the weekend (Ubuntu is a Linux distro – an open source operating system). Apart from some nervousness on my part about losing any info from my Windows partition, the install was completely painless. The interface is really slick – it is obvious that lots of time and thought went into the look and feel of this OS. It is also incredibly fast (despite being installed into a single file in the Windows partition as opposed to a normal install). From a standing start to being able to open a web page Vista took four minutes thirty seconds on this machine. Ubuntu took one minute fifty seconds on the same machine. I’m trying out Evolution now (email client) and I will start trying other apps as well to see how they compare. For now though, I am impressed. I want to install a copy of Ubuntu on my laptop. However, when Vista was installed on it, a single partition was made of the hard drive so if I try to install Ubuntu now, it will overwrite the Vista partition (I assume, anyone knowing better, feel free to jump in!). I presume that what I need to do is backup my Vista install, partition the drive into one partition for Vista and one for Ubuntu, restore the Vista into its partition and install Ubuntu into its partition. Can anyone recommend software to allow me to backup my Vista install (including all my installed apps and settings), so that I can restore it again later. In case it is relevant, I don’t have a floppy drive for the laptop. Update – since posting this I came across Wubi – an Ubuntu installer which installs Ubuntu into a Windows partition. This could be an easier solution. I’ll try that and see how I get on. Up is down, black is white, Microsoft does Linux deal with Novell! From the “They said it would never happen dept” comes news today that Microsoft have signed a deal with Novell! Under a technical cooperation agreement, Novell and Microsoft will work together in three primary areas to deliver new solutions to customers: virtualization, web services management and document format compatibility. Under a patent cooperation agreement, Microsoft and Novell provide patent coverage for their respective customers, giving customers peace of mind regarding intellectual property issues. Under a business cooperation agreement, Novell and Microsoft are committing to dedicate marketing and sales resources to promote joint solutions. The timing of this deal is curious, coming as it does only a few short days after Oracle announces its enhanced support for Linux! Looks like a competition to see who can love Linux the most these days, doesn’t it? 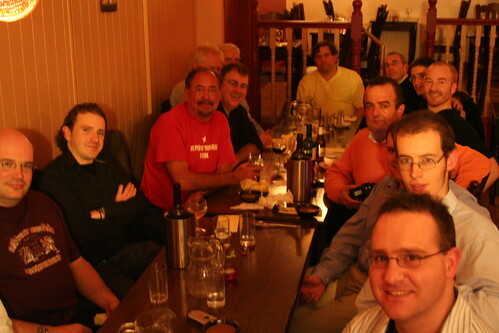 Last night’s blogger’s dinner was a great success – thanks to Pat for organising (and paying for) it. Shel Israel and Rick Segal were the guests of honour and both had lots of interesting info to impart. Rick talked up MusicIP – I missed the start of the conversation but I assume MusicIP is a company he has invested in. MusicIP scans your music (Windows, Linux, Mac) and creates playlists for you based on your mood!!! amongst other things. Little did I realise when I first started conversing with Shel last year that I’d convince him to come to Cork twice this year (first for the it@cork Web 2.0 conference and now for his global tour) – it just goes to show the power of blogs as a networking tool! I see where Apple has applied for a patent that allows the computer maker to protect the installation of Mac OS X so that it can only be used on Apple produced hardware. No real surprise there. 22. The method of claim 20, wherein the first operating system is selected from the set consisting of Mac OS X, Linux, and Microsoft Windows. 23. The method of claim 20, wherein the second operating system is selected from the set consisting of Mac OS X, Linux, and Microsoft Windows. So Apple are stopping OS X from being installed on other hardware while simultaneously allowing multiple OSs on Apple hardware? The only way to run OSX will be to buy a Mac. But once you have bought a Mac, you can run whatever you want on it. This would certainly make Apple’s hardware quite attractive for people who need access to multiple OSs. Mark Evans has written an article about a new Ad Serving company called AdGenta. It is supposed to deliver more relevant ads because you upload your blogs posts through a downloadable AdGenta application called Qumana (where do they come up with these names?). You compose the post in Qumana, click on the advertising button and an ad is placed into your article based on the text of your piece. Hello? Where is the Mac version? And the Linux version? metaWeblog? Who uses metaWeblog? Where is the WordPress support? What about LiveJournal? TypePad? Guys – if you want to take on the big boys you need to get bloggers on board, – to do that, you need to support the platforms we use. In a previous post I explained how to create a .htaccess file to stop remote image linking (hotlinking) and bandwidth theft – however, there are some situations where you might want your image files linked to from remote sites – how do you make exceptions for these sites? And obviously, everywhere you see my domain (tomrafteryit.net) in the code, substitute in your own domain. In my last post on using .htaccess to block direct linking of images, I advised simply using the RewriteRule to forbid display of images (i.e. RewriteRule .(gif|png|jpg|jpeg? )$ – [NC,F]). This is a nice simple rule which works a treat to block display of your images on remote sites. However, if you want to take this a step further, you can re-direct requests for images from remote webpages to an image of choice on your website. I have created an image, called stolenimage.jpg, which simply says “This image is stolen”. Anyone trying to link directly to images on my site is, therefore, inadvertantly serving that image on their pages. This is the same code as is in my previous post except for the RewriteRule. It is a very good idea not to redirect a browser from one file type to another. The cleanest approach is to make a seperate version of your the stolenimage.jpg file in each format that you use on your site – for example I have one in gif format, one in jpg format, one in jpeg format, and one in png format. Then redirect each hot-linked image to the matching filetype. In the RewriteRule above, the “$1” in the last line refers back to the contents of the parenthesis in the same line. That is, a request for a .jpg file will be redirected to http://www.tomrafteryit.net/stolenimage.jpg, and a request for a .gif file will be redirected to http://www.tomrafteryit.net/stolenimage.gif, etc. The L in the square brackets is the “last rule” – it stops the rewriting process here and tells the .htaccess file not to apply any more rewriting rules. See the Apache mod_rewrite URL Rewriting Engine page for more. Obviously, if you are feeling a bit mischievous, you can serve other images to people hotlinking your images – “Free shipping worldwide – we ship anywhere for free”, “Order one, get three free” or “This site supports the Taliban’s policy on Feminism” are some possibilities! You are only limited by your imagination. Many thanks to all the contributers to the WebmasterWorld forums, from where I gleaned most of the information in these posts.